Surrounded by agricultural countryside and the mountains of Campanet, we find this modern villa with private pool, prepared for up to 6 persons. This is a truly beautiful terraced house for 6 guests, situated in the genuine town of Campanet. Welcome! Cosy village house in the beautiful town of Campanet, on the foot of the Tramuntana mountain range, with capacity for 6 guests. Welcome to Coco de Fangar! Surrounded by a small romantic forest you will discover the beauty and comfort of a home that will make your holidays an unforgettable experience. Quiet hideaway, perfect for hikers or cyclists, with private pool and mountain view in Campanet. 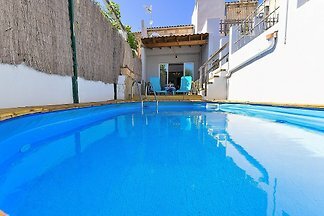 This charming terraced house in Campanet, in the north of Mallorca, can comfortably accommodate 8 people. Fantastic rustic finca located in the countryside near Campanet, in the north of the island. It can accommodate 10 people. Tucked away somewhere in the Tramuntana mountains, near Campanet, you will find this extraordinary house for 2 - 4 guests. This lovely house with a private swimming pool, located in Campanet, will make feel 6 guests like at home. Rent successfully your holiday flat or holiday home in Campanet in only 20 minutes !